Gift shops have always been popular at Letchworth Park. Visitors, eager for a physical reminder of a wonderful day in the Valley, have taken home everything from postcards to porcelain plates. This is not a new phenomenon. Even in the days of Mr. Letchworth, visitors wanted to take home a souvenir from their trip to the Glen Iris Estate. 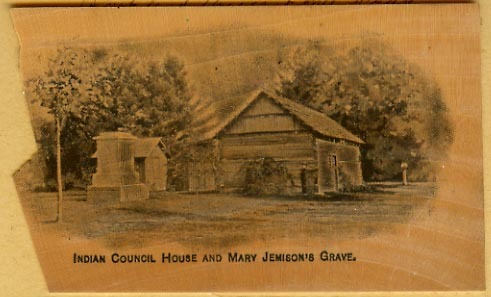 By the 1880's, such mementoes were available on the Council Grounds. According to Beale, the caretakers on the Council Ground sold "napkin rings, pen holders, beaded satchels and Indian pipes, all with the legend, "Indian Council House." She goes on to state that "One novelty which Letchworth admired was calling cards made of very thinly sliced wood, and he arrange to have some made from trees cut off his place." Seen below is one of these actual "calling cards" which Letchworth had made for his Council Grounds. It is about 2" X 3 1/2" and on a very thin slice of wood. Some can be found with their original sleeve.